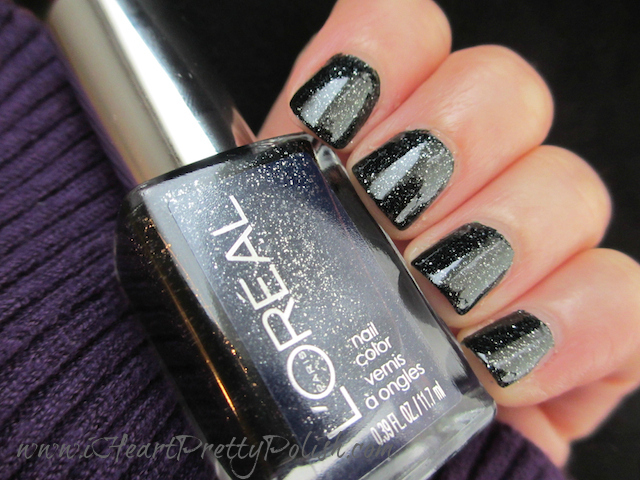 This is L'Oreal The Queen's Ambition from the 2012 Project Runway Collection. I thought a black with silver shimmer would be a great alternative to the creamy black finish. I went on a search for the Nicki Minaj "Metallic for Life" but I guess I'm a little too late because I can't find it in stores anymore. I was walking through Target and saw the new L'Oreal Project Runway Display - and there it was - a black nail polish with silver shimmers. Of course, I grabbed it because L'Oreal makes some great nail polishes. I have been wearing this for 24 hours now and I think I'm in love. I really do enjoy black nails and the silver shimmer gives it a little extra ooommph. This is a very opaque polish, but it wasn't very shiny on it's own. It almost had a suede finish. Because of the finish, it dried really quickly. I threw my Essie Good to Go on top and it was dry in no time flat. I'm sure you can find a polish like this in any brand, but I think everyone should own a version of this. It's very chic. Excellent nails! Mine are somewhat similar to yours, I am wearing Storm by Zoya. 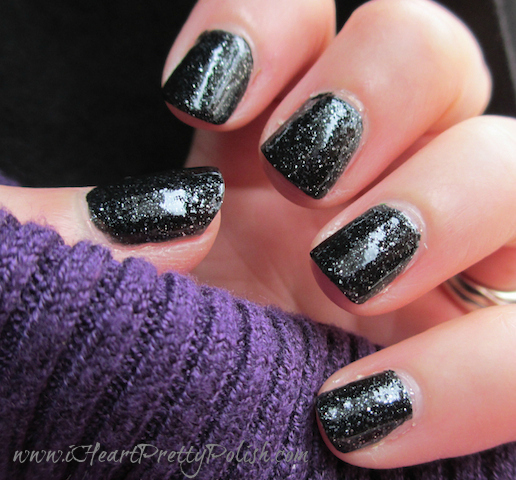 It is a black base with holographic glitter. It is gorgeous! I think you'd like it. Enough day dreaming about nail polish, back to work I go! That does sound pretty. Have fun at work! Such a pretty lacquer! Looks great on you!! This looks amazing on you, Essie! You know I love black polish (TOTAL pain to clean up, but worth the effort, always). I'm so excited you got this. I love L'Oréals, too, but I love Butters even more and I think this might be similar to Gobsmacked... I ought to take advantage of the current Ulta sale and snag it, lol. Anyhoo... This looks absolutely beautiful. I have seen that and keep thinking I should get it. I totally should! Yep, it's a cool polish! This is a beautiful shade!! Yes, I really enjoy it. I love these amped-up blacks, it looks beautiful on you!!! My two favorite plain black polishes are Camelot from A England for shiny finish and Illmasqua Scorch for satin finish. They both apply ridiculously easy and your nails will appear classy and sophisticated!!! Thanks I'll have to check those out.